Open Science is a key priority of the Dutch EU Presidency. The Netherlands is committed to open access to scientific publications and the best possible re-use of research data, and it would like to accelerate the transition this requires. That is the reason the Dutch Presidency Open Science Conference was organised on April 4-5 in Amsterdam. The invitees included politicians and officials, and stakeholders from all over Europe, such as researchers, publishers, representatives of universities and research organisations, and organisations and companies that support research. The two day conference was very intense, with the first day largely presentation based and the second providing possibilities to interact and comment on the Amsterdam Call for Action on Open Science. This Call for Action will be presented in May in a meeting of the ministers of all 28 member states by Sander Dekker, the Dutch Undersecretary for the Ministry of Education, Culture and Science. 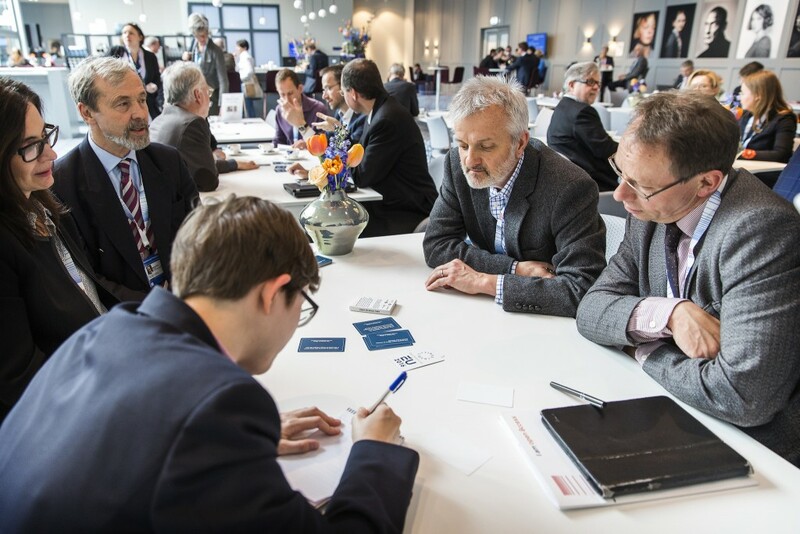 Delegates were very pleased with the four Open Science Cafes that were organised on day two. All participants were given the opportunity to share their thoughts and experiences on different Open Science topics in four different cafes. Many of them joined our FutureTDM café on text and data mining. 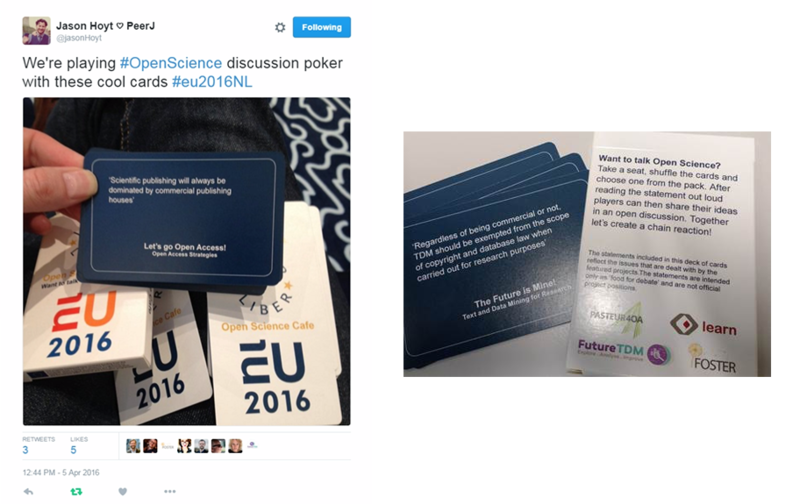 A kick starter for the discussions in the four cafes were cards with statements on open Science. The TDM cards included provocative statements such as: ‘Where exceptions or limitations are introduced into copyright law to allow content mining, these should be mandatory and may not be overridden by contracts’ or ‘TDM is only of value to the hard sciences, not to humanities’. Out of this came some interesting insights. As could be expected based on the diversity of conference delegates, the spectrum of opinions was very broad. Some participants said to be against a copyright exception; they saw licenses as the solution; and they saw licenses as needed to recoup costs in a non-Open-Access publishing model. Others responded to this statement stating that the laws governing TDM shouldn’t be framed/worded as an “exception” because an exception implies that TDM falls within scope of copyright in the first place, which they see as not the case. The outcomes of the cafes were dozens of suggested action points, which were shared back with the participants in the closing plenary session by LIBER Executive Director Susan Reilly. The TDM specific views, statements and actions points will feed back into the FutureTDM Knowledge hub. 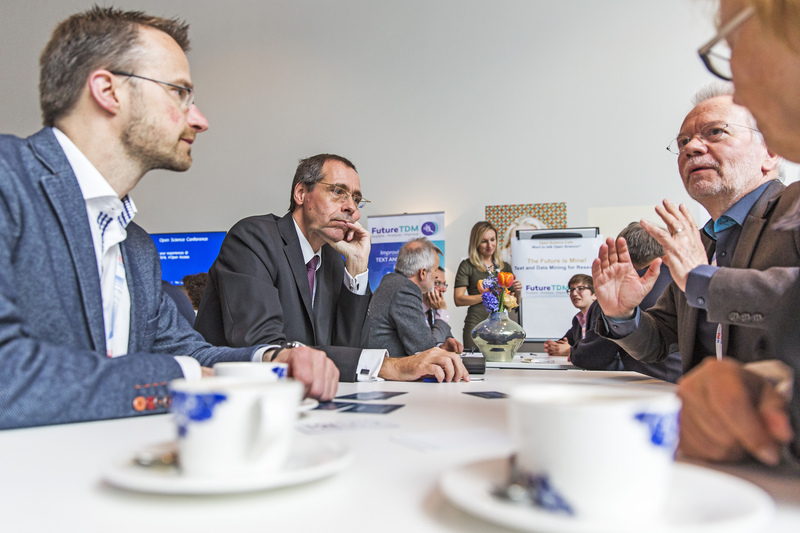 The Open Science cafes were also featured in the official EU2016NL Conference video.